This is Napoleon’s unilateral appendix to the Concordat. It aims to prevent past problems from re-appearing: sectarian strife, clerical abuses and counterrevolution by diehards like the Royal and Catholic Army in the Vendee.Napoleon's method of bringing a concordat under partial legislative control by modifying it retroactively was later imitated in Germany. 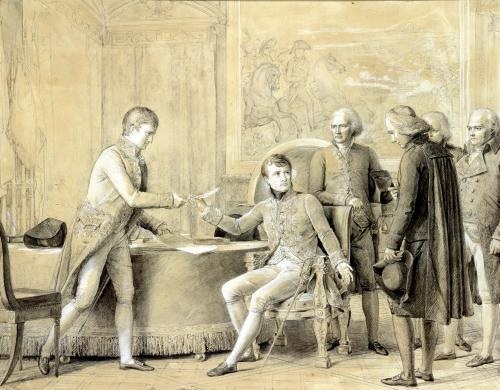 Napoleon signs the Organic Articles. In accordance with §43 below, Cardinal Consalvi, Papal Secretary of State is dressed in black, like a French cleric, presumably with “violet stockings”. ♦ Some of the clauses of the Organic Articles were a reaction to the revolt mounted by the alliance of clerics and royalists in the Vendée which had finally been (brutally) supressed only five years previously. About half the parish priests had refused to take the oath of loyalty to the new French Constitution. They were then expelled from their parish churches and replaced by “Constitutional Priests”, elected by the public. The dissident priests retreated to places like convents in order to conduct Masses, “collecting assemblages of Anti-Constitutional individuals, who have grown devout all on a sudden….”  To try to head off a recurrence, articles 1-4 in the Organic Articles authorised the state to monitor any Church activities that had the potential to be politcally dangerous..
♦ Other articles seem intended to prevent a recurrence of abuses under the Bourbons, such as clerics who are absentee (Art. 29) or idle (Art. 70). ♦ Still others are attempts to avoid a return to religious strife, such as forbidding public processions in towns where there are adherents of different creeds (Art. 45). Napoleon’s method of bringing concordats under partial legislative control by modifying them retroactively was to set an example. Twenty years later when many of the German states signed concordats, they, too, limited them by means of national legislation. However, the Vatican now claims that concordats are international treaties which cannot be overridden by national laws. Of the governance of the Catholic Church in its general relations with the rights and the police of the state. Art. 1. No bull, [papal] brief, rescript, decree, mandate, appointment [to a benefice], signature serving as an appointment, nor other documents from the court of Rome, even ones only concerning individuals, can be received, published, printed or otherwise put into effect without the authorisation of the Government. 2. No person calling himself nuncio, legate, vicar or apostolic commissioner, or availing himself of any other name, can, without the same authorisation, exercise on French soil or elsewhere any function relating to the affairs of the Gallican church. 3. The decrees of foreign synods, even those of general councils, cannot be published in France before the Government has examined their form, their conformity with the laws, rights and freedoms of the French Republic, and every way in which the publication might disturb or affect public peace. 4. No national or metropolitan council, no diocesan synod, no deliberative assembly will take place without the express permission of the Government. 5. All ecclesiastical offices will be free of charge, except the oblations which may be authorised and fixed by regulations. 6. There will be right of appeal to the Council of State in all cases of abuse [of power] by Superiors and other ecclesiastical persons. Cases of abuse are usurpation or excess of power, contravention of laws and regulations of the Republic, infraction of the rules sanctioned by the canons accepted in France, violation of freedoms, exemptions and customs of the Gallican church, and any undertaking or proceeding which in the exercise of worship can compromise the honour of the citizens, arbitrarily disturb their conscience, degenerate into oppression or injury against them or into public scandal. 7. By the same token there will be right of appeal to the Council of State, if there is an infringement of the exercise of public worship and the freedom that the laws and regulations guarantee to its ministers. 8. The right of appeal extends to all interested persons. Where there is no personal complaint, it will be exercised by the prefects. The public functionary, the ecclesiastic or the person who would like to make this appeal will address a detailed and signed memorandum to the Councillor of State charged with all matters relating to worship, who will be obliged with the least possible delay to take all the appropriate measures; and on his report, the matter will be followed up and definitively resolved in an official form or referred, as the case may be, to competent authorities. 9. Catholic worship will be carried out under the direction of the archbishops and bishops in their dioceses, and under that of the curates in their parishes. 10. Every privilege granting immunity or attribution to episcopal jurisdiction is abolished. 11. The archbishops and bishops will be able, with the authorisation of the Government, to establish cathedral chapters and seminaries in their dioceses. All other ecclesiastical establishments are suppressed. 12. The archbishops and bishops will be free to add to their names the title of Citizen or Monsieur. All other designations are forbidden. 13. The archbishops will consecrate and install their suffragans. In case of hindrance or of refusal on their part, the most senior bishop of the metropolitan district will act on their behalf. 14. They will watch over the maintenance of the faith and the discipline in the dioceses making up their archdiocese. 15. They will recognise any claims and complaints launched against the conduct and the decisions of the suffragan bishops. 16. No one can be nominated bishop before the age of thirty or if he isn’t of French origin. 17. Before executing the decree of nomination, the one or ones who will be proposed will be obliged to supply a certificate of good character and morals, sent from the bishop in the diocese in which they have exercised the functions of ecclesiastical ministry; and they will be examined about their doctrine by a bishop and two priests who will be commissioned by the First Consul. These will address the result of their examination to the Councillor of State charged with all matters relating to worship. 18. The priest nominated by the First Consul will hasten to obtain the investiture from the pope. He will not be able to exercise any function before the bull containing his investiture has received the attachment from the Government and before he has in person taken the oath prescribed by the convention undertaken between the Government and the Holy See. This oath will be delivered to the First Consul; there will be a record of it drawn up by the Secretary of State. 19. The bishops will nominate and invest the curates; nevertheless, they will not announce their nomination, and they will not invest them, until this nomination has been agreed to by the First Consul. 20. They will be required to reside in their dioceses; they will not be allowed to leave them, except with the permission of the First Consul. 21. Each bishop will be able to nominate two vicars general, and each archbishop will be able to nominate three: they will choose them from among the priests possessing the qualities requisite for an archbishop. 22. Every year they will personally visit a part of their diocese, and within five years, the whole diocese. In case of a legitimate impediment, the visit will be carried out by the vicar general. 23. The bishops will be responsible for organising their seminaries, and the rules of this organisation will be submitted for the approval of the First Consul. 24. Those who will be chosen to teach in the seminaries, will subscribe to the declaration made by the clergy of France in 1682, and published by an edict the same year : they will consent to teach in them the doctrine that is contained therein; and the bishops will address a copy in due form to the Councillor of State charged with all matters relating to worship. 25. Every year the bishops will send to this Councillor of State the names of the persons who will study in the seminaries and who intend to take up ecclesiastical office. 26. They will not ordain any ecclesiastic unless he proves that he has property producing an annual revenue of at least three hundred francs, that he has reached the age of twenty-five years and that he possesses the qualifications laid down by the canons accepted in France. The bishops will not carry out any ordination before the number of those to be ordained has been submitted to the Government and agreed to by it. 27. The curates can only begin exercising their office after taking at the hands of the prefect the oath stipulated by the convention made between the Government and the Holy See. A statement of this oath-taking will be prepared by the Secretary General of the prefecture, and a conferring copy of it will be sent to them. 28. They will be invested by the curate or the priest whom the bishop will designate. 29. They will be required to reside in their parishes. 30. The curates will be directly subordinate to the bishops in the exercise of their office. 31. The vicars and the officiating ministers will exercise their ministry under the supervision and the direction of the curates. They will be approved by the bishop and can be revoked by him. 32. No foreigner can be employed in the functions of an ecclesiastical minister without the permission of the Government. 33. Every function is forbidden to every ecclesiastic, even a French one, who do not belong to any diocese. 34. A priest will not be permitted to leave his parish to go and serve in another one without the permission of his bishop. Of the cathedral chapters and the government of the diocese during the vacancy of the see. 35. The archbishops and bishops who would wish to use the option given them of establishing chapters will not be allowed to do so without having obtained the authorisation of the Government, both for the establishment itself as well as for the number and the choice of the ecclesiastics who are designated to constitute it. 36. During the vacancies of the sees, supervision will be exercised by the metropolitan and, in his absence, by the oldest suffragan bishop in the government of the dioceses. The vicars general of these dioceses will continue their functions even after the death of the bishop until he is replaced. 37. The metropolitans, the cathedral chapters will be held without delay to advise the Government about the vacancy of the sees and about the measures which will have been taken by the government of the vacant dioceses. 38. The vicars general who govern during the vacancy, as well as the metropolitans or capitulars, will not be permitted to introduce any innovation in the usages or customs of the dioceses. 39. There will be only one liturgy and one catechism for all the Catholic churches in France. 40. No curate may order special public prayers in his parish without the special permission of the bishop. 41. No holiday, with the exception of Sunday, may be established without the permission of the Government. 42. In religious ceremonies the ecclesiastics will employ the habits and insignia fitting to their rank: they may not in any case or under any pretext use the colour and the distinctive marks reserved for bishops. 43. All ecclesiastics will be dressed in the French manner in black. The bishops may combine with this garb the pastoral cross and the violet stockings. 44. Domestic chapels and private oratories may not be established without express permission of the Government, granted at the request of the bishop. 45. In cities where there are temples dedicated to different religions no religious ceremony is to take place outside of the buildings consecrated for Catholic worship. 46. A single temple can be consecrated for only one form of worship. 47. In cathedrals and parishes there will be a place of distinction for Catholics who belong to the civil and military authorities. 48. The bishop will plan together with the prefect to regulate the manner of calling the faithful to divine service by the sound of bells. No one may ring them for any other reason without the permission of the local police. 49. When the Government orders public prayers, the bishops will plan together with the prefect and the military commandant of the place, as to the day, the hour and the manner of carrying these ordinances into effect. 50. The formal preaching, called sermons, and those known as stations of Advent and of Lent, will only be carried out by priests who have obtained a special authorisation for these from the bishop. 51. At the sermons of parish masses the curates will pray and cause prayers to be offered for the prosperity of the French Republic and for the Consuls. 52. They will not permit themselves in their teaching to make any accusation, direct or indirect, either against individuals or the other religions authorised by the state. 53. In sermons at the Mass they will not make any announcement foreign to the exercise of worship, except those authorised by the Government. 54. They will give the marriage blessing only to those who will prove, in good and proper form, that they have contracted marriage before the civil officer. 55. The registers held by the ministers of religion, since they only exist and can only exist relative to the administration of sacraments, cannot in any case take the place of the registers prescribed by law to establish undeniably the civil state of the French. 56. In all ecclesiastical and religious documents it will be obligatory to employ the equinoctial calendar established by the laws of the Republic; the days will be designated by the names that they had in the solstitial calendar. 57. Sunday will be fixed as the [day of] rest of public functionaries. 58. There will be in France ten archbishoprics, or metropolitan sees, and fifty bishoprics. 59. The circumscription of the metropolitan sees and the dioceses will be carried out in conformity with the attached table. 60. There will be at least one parish in each [district covered by a] justice of the peace. In addition, there will be established as many chapels of ease as may be called for. 61. Each bishop, together with the prefect, will regulate the number and extent of the chapels of ease. The final plans will be submitted to the Government and will not be implemented without his authorisation. 62. No part of French territory may be set up as a parish or a chapel of ease without the express authorisation of the Government. 63. The priests officiating at chapels of ease are nominated by the bishops. 64. The salary of the archbishops will be 15,000 francs. 65. The salary of the bishops will be 10,000 francs. 66. The curates will be divided into two classes. The salary of curates of the first class will be fixed at 1,500 francs; that of curates of the second class at 1,000 francs. 67. The pensions that they have enjoyed in accordance with the laws of the Constituent Assembly will be deducted from their salaries. The general councils of the large communes will be permitted to grant them an increase in salary for their rural properties or for their town dues, if the circumstances require it. 68. The vicars and the officiating ministers will be chosen from among the pensioned ecclesiastics in accordance with the laws of the Constituent Assembly. The amount of these pensions and the proceeds from the oblations will form their salary. 69. The bishops will draw up draft regulations relating to the oblations which the ministers of religion are authorised to receive for the administration of the sacraments. The draft regulations drawn up by the bishops cannot be either published or otherwise implemented before being approved by the Government. 70. Every ecclesiastic pensioned by the State will be deprived of his pension if he refuses without just cause the functions that may be entrusted to him. 71. The general councils of the department are authorised to obtain for the archbishops and bishops suitable dwellings. 72. The presbyteries and the adjoining gardens which have not been alienated will be returned to the curates and the officiating ministers of the chapels of ease. Where these presbyteries are lacking, the general councils of the communes are authorised to obtain a dwelling and a garden. 73. Endowments which are meant for the support of the ministers and the exercise of worship will consist only of income assigned by the state. They will be accepted by the diocesan bishop and can be carried out only with the authorisation of the Government. 74. Immovables other than buildings intended for dwellings and the adjoining gardens cannot be allocated to ecclesiastical titles nor possessed by ministers of religion by virtue of their functions. 75. To provide a building for the parish and for the chapel of ease, the buildings formerly intended for Catholic worship which are now in the hands of the nation will be put at the disposition of the bishops by order of the prefect of the department. A copy of these orders will be addressed to the Councillor of State charged with all matters relating to worship. 76. Workshops will be established to supervise the maintenance and conservation of temples and the administration of alms. 77. In those parishes where there is no building at all that can be used for worship, the bishop will consult with the prefect about the designation of a suitable building. 2. At this point the printer lost track of the Roman numerals and followed Article 57 with Article 60. The content of the misnumbered articles was preserved, but not the content of this heading, which has therefore been reconstructed by the translator.